Can traditional corporate marketing survive an apocalypse? I’ve put in my time working at the cold face with old dog-breath (aka the unimaginative boss) sat behind me, trying to stimulate the market by churning out what he thinks the market needs. Then old dog breath yaps in the ear of the corporate board to a team of executives who have no idea what marketing is or how it works. I witnessed this in organisation after organisation, until I decided to hit the ejector seat. Anyone seen the film? Months of work go into a complicated plan of attack that may or may not hit the mark. It reminds me of the corporate marketing machine, except that in the film (spoiler alert) the mission succeeds. The big idea the months of development to get the biggest prize, but all too often the campaign bounces on the surface of success and eventually sinks to the bottom of the dam. Sound familiar? Anyone who hasn’t been living in a cave for the past decade knows that marketing has changed. Consumers have changed, businesses have changed, platforms have changed. 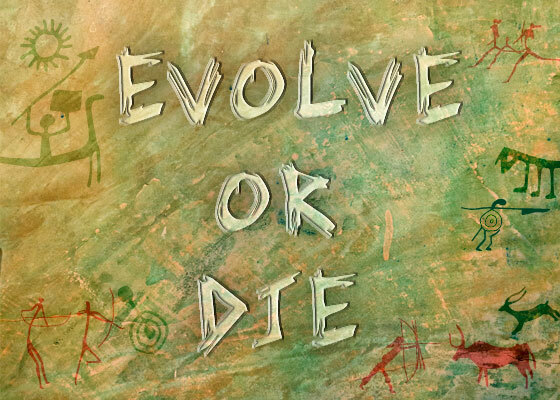 The only way for corporations to survive in the brave new world of online, social and inbound marketing is to ditch prehistoric practices and evolve. Companies need to adopt a more fluid, progressive model, putting the audience at the heart of everything they do, as well as keeping a firm eye on ROI. What marketing collateral are you going to produce? Who is it targeted to and how does each piece help towards generating ROI? Website and social media are great, but monitoring visitors, leads and engagement is the key to honing and perfecting your strategy. If our prehistoric ancestors had never learnt to stick together, the sabre-toothed tigers would be running the world right now. My point is, everyone in the business needs to embrace the new strategy and work together. That goes from the marketing intern right up to the CEO. So in short, it’s not quite the End of the World. At least not for everybody. Listen to your customers, measure results and keep a close eye on ROI. Otherwise it could all go south faster than you can say ‘Survival of the Fittest’. To find out how a modern approach can help your business to survive the traditional marketing apocalypse, have a look at this free eGuide, ‘How to implement a pull marketing strategy’.